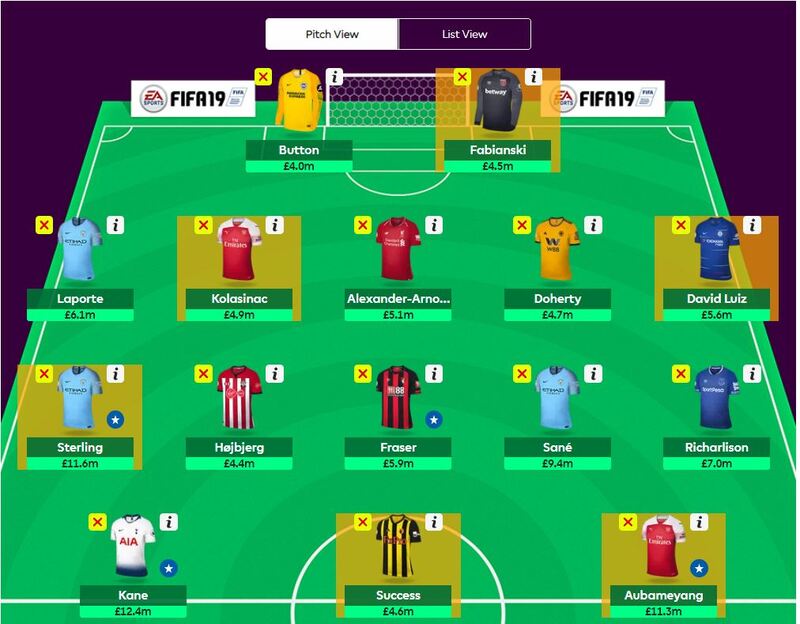 Here’s our fantasy premier league wildcard tips GW16 article where I pretend I’m using my wildcard. It gives player suggestions with more longevity than just for the up coming gameweek. There’s the team, a table of stats ad their upcoming fixtures. My value at the moment is a fairly low £102.3m and the team fits within £103.0m which is hopefully many of you. The team is set up mainly to play 4-4-2 and to a lesser extent 5-3-2. That is one of the disadvantages of having Success and Hojbjerg as it means the lack of depth on the bench restricts formation and makes the team less flexible. However, it should mean you have less bench disasters when you get the lineup wrong. That is one of the annoying by products of a strong bench. I suspect after this week Sterling, at the expense of Salah and Aubameyang, at the expense of Arnautovic, will fall into this category. The bench players are Hojbjerg, Success and Button. That leaves 4 differentials in Kolasinac, Laporte, Fraser and Sane who will be your primary rank affecting players. Player values are as of Friday 7 December. Despite only 2 clean sheets Fabianski is the top equal £4.5m ish point scorer with only Hart making more saves. A great run of fixtures is the hope that the clean sheets will improve. With only 1 clean sheet in their last 5 it’s easy to start doubting the Man City defence. Add to that fact that while Laporte is probably the most certain starter, he hasn’t shown much premier league attacking or bonus potential. Those facts mean you’ve got a lot of sceptics on your hands. However, no team has better underlying defensive xG and shot against stats. Furthermore only 3 times have sides got an xG of 1 goal or over in a game against them. I’m betting there clean sheets will improve. A gamble here with the LWB only coming into the Arsenal side in the last 5 games and with Monreal presumably not that far away. However Monreal could be part of the back 3 especially given Holdings injury. With only 2 clean sheets so far this is more about the fixtures and his attacking potential than the immediate defensive prospects although Huddersfield at home is a good entry point. It’s no clean sheet in the last 7 for the Wolves defence although Doherty has softened the blow with a goal and an assist. That 7 game run did involve Spurs, Arsenal and Chelsea however which was unlikely to see clean sheets. Despite 2 calamitous performances against Wolves and Spurs it’s still 3 clean sheets in the last 6 for the Chelsea defence. Also non top 6 sides have only got an xG of greater than 1 goal twice in the first 15 games. So there are positives there. The gamble with Luiz is that he didn’t play vs Wolves (although neither did Jorginho). I’d rather have Alonso but the price difference makes it difficult to justify and fit other things in the team. Just there as a fairly guaranteed starter to come off the bench with little points potential . Is on 4 yellow cards so hard to see how he avoids a 1 game suspension before December 31. Only his team mate Wilson has more FPL assists than Fraser’s 7. Only David Silva has a better xA when on the pitch than Fraser and that’s only just. Has tricky fixtures but the price means the occasional benching isn’t the end of the world. The fact that Sane has returned a goal or assist every time he’s started says alot. Lack of early season gametime, no World Cup and the injured Mendy meaning he is the left hand side’s width, in theory means he should have reasonable gametime security. 4 goals and 2 assists in his last 5 games, returning in all 5 with some decent shot volumes and it’s a sign that the 17/18 Kane could be back. It’s a pretty decent fixture list coming too. Just there to come off the bench. Started 6 of the last 7 games. The leading FPL point scoring striker with 10 goals and 3 assists from 13 starts and 2 as sub. 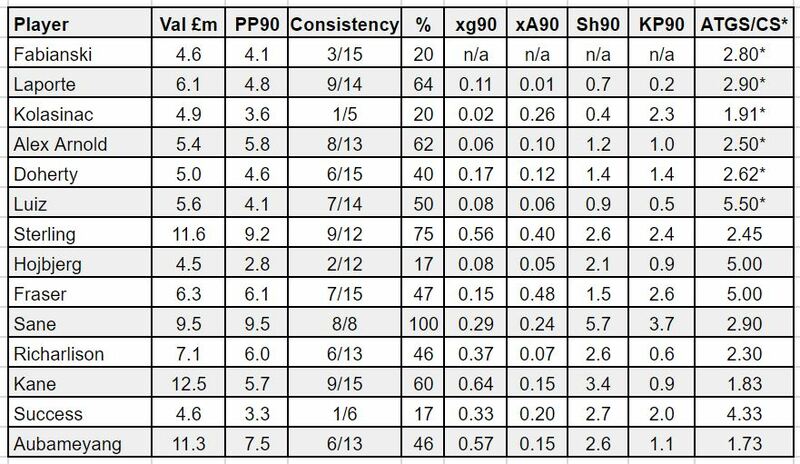 His underlying stats could be better with Aguero, Morata and Vardy all having better non penalty xG90. However this is more about fixtures and captain potential. The problem is the unpredictability of EMery’s selection. Emery has only ever played 1 striker and up until the last 2 games that has mostly been with Lacazette as CF with Auabmeyang as a left sided attacking midfielder. Not surprisingly there’s a decent disparity in Aubameyangs stats between playing AML and playing CF. With Emery now going to 3-4-2-1 it makes it look like a more 1 striker pick each week. However substitutions with Lacazette on v Man Utd and Arsenal made it a 3-4-1-2 which could be implemented against the lower ranked sides. However I can theorise to the cows come home the upshot is this is Unai Emery so who knows? I’m not even sure Aubameyang starts in GW16? Lacazette could easily return to CF. However that is the risk you take for the fixtures. My team is close to this one after 8p hit yesterday. Except Jiminez, Alonso, Bennet, AWB instead of Success, Luiz, Doherty and Kolasinac.